I feel like I've been waffling on whether or not to read this book for years now even though it's only been a few months. The thing is, I really enjoyed the first half of Rainbow Rowell's Attachments. I really, really did. And then I was summarily disappointed with the second half. I don't know if it was me or the fact that I read it immediately after giving birth and that just rarely ever works out for me or what. But the direct result was that I stayed away from Eleanor & Park, despite it's adorable cover and quirky premise. And I was apparently still shell-shocked enough that I was going to just go ahead and pass on Fangirl if it wasn't for Janice's enthusiastic review some weeks back. I thought I was just sort of waltzing around lacking the Rowell gene, when in fact I simply hadn't found my gateway book. So, Janice. Can I send you a book bouquet or a fruit basket or some such gift of gratitude? Because I'm kind of having a hard time imagining my reading year without this book. This hilarious, complicated book that induced all the feelings in the general vicinity of my heart. Cath doesn't do social situations. Outside of her twin sister Wren and her dad, few people have been able to penetrate the force field of solitude with which she surrounds herself. Even her high school boyfriend Abel was really just a placeholder, a nice idea of a boyfriend. But there has always been Simon. And Baz. Ever since they were kids, Cath and Wren have teamed up to write Simon Snow fan fiction. And when the more vivacious Wren's social life took flight, Cath soldiered on alone. Dedicated to the fictional world of Simon Snow, her followers grew to number in the tens of thousands and sating their voracious appetites became a full-time job. Which is why college seems to be getting in the way so much. Having to make small talk with her roommate Reagan and Reagan's kinda sorta ex Levi sends Cath into paroxysms of exhaustion. Not to mention her demanding class schedule and not knowing where the cafeteria is and worrying about leaving her dad all alone at home to fend off loneliness. Cath is a basket case. Fortunately, her roommate can read the writing on the wall and stages an intervention. And thus begins Cath's tentative exploration of life off the page. But when Wren's life threatens to run off the rails and their long-estranged mother re-enters their lives, Cath's only refuge remains with Simon and his sometime nemesis, sometime partner Baz. She didn't look over at Levi again until they were standing together in front of the elevator. (Condition: smiling, stable). When it opened, he put his hand on her back and she practically jumped in. "I just want to know—are you rooting for me? Are you hoping I pull this off?" "I'm rooting for you," she whispered. She wasn't even sure he could hear her from the bed. Levi's smile broke free and devoured his whole face. I will never tire of Levi's smiles. But as smitten as I was, the focal center of the book remained Cath for me. And I'm so glad Ms. Rowell kept the whole thing so tightly focused on Cath's struggles, both with the world inside her head as well as with the world around her. Initially, I was wary of the actual Simon Snow excerpts (to say nothing of Cath's fan fiction sections). But Rowell surprised me with her deft interweaving of Cath's own life and the life she breathed into Simon and Baz and the whole Watford School gang. To be perfectly frank, she surprised (and wowed) me with the level of nuance on the grand scale. And before long, Cath's dorm room felt like home to me, felt disturbingly like my own dorm freshman year, papered with clippings and memorabilia declaring who I had been, threaded through with anxiety and hope for who I would become. I knew who Cath was. I could see her with perfect clarity. Last of all, one of the most visceral moments in the book, in which Cath confronts the woman who gave birth to her and abandoned her ten years later. "You don't just leave somebody alone in a hospital," Cath said. It came out aflame. "Wren's not alone," Laura said sternly. "She has you." Cath jerked to her feet and swayed there. Not Wren, she thought. I didn't mean Wren. Laura wrenched her handbag straps higher. "Cather—"
"You can't leave like this—"
"It's the right thing to do," Laura said, lowering her voice. "In what alternate universe?" Cath felt the rage burst up her throat like a cork popping. "What sort of a mother leaves the hospital without seeing her kid? What sort of a mother leaves? Wren is unconscious—and if you think that has nothing to do with you, you are skimming the surface of reality—and I'm right here, and you haven't even seen me for ten years, and now you're leaving? Now?" "Don't make this about me," Laura hissed. "You obviously don't want me here." "I'm making it about me," Cath said. "It's not my job to want you or not want you. It's not my job to earn you." "Cather"—Laura's mouth and fists were tight—"I've reached out to you. I've tried." "You're my mother," Cath said. Her fists were even tighter. "Try harder." And that is how it's done. That is how you secure my everlasting loyalty for a character. She's so strong in that scene. Her fists are tighter. And I love her so much for saying what she needed to, for getting it out. I loved every word of Fangirl. As my friend Laura says, some books move in. I had a bed all made up for this one faster than Levi can crack a smile. Book Harbinger - "I found myself periodically detaching from the story." Cuddlebuggery - "I want to grow old and die with it wrapped lovingly in my arms knowing that we’ve had a long and happy life together." Dear Author - "I was rooting for all of them." Ivy Book Bindings - "I found that Rowell tackled everything beautifully in this novel." 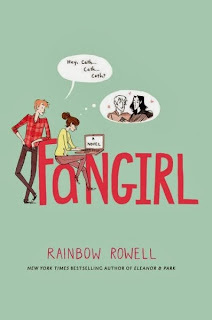 Prettybooks - "Fangirl is one of the most wonderful, accomplished, authentic YA contemporary novels I’ve come across. I think we needed it." Specfic Romantic - " It actually seems to get better the more I reflect on it after finishing it." Attachments was definitely not the one to read first! But now that you are in love with Fangirl, I highly recommend Eleanor and Park. I loved the characters almost as much. That Park is just so wonderfully drawn. 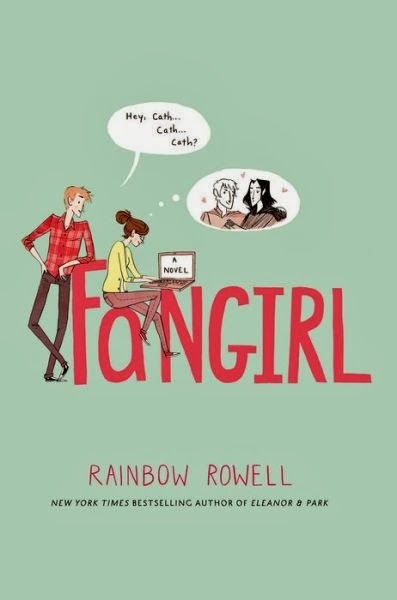 I had been trying to decide whether to buy Fangirl for ages until last week when I was lurking on twitter and saw your brief mention about loving it. I ordered it a couple minutes later (!) and it arrived yesterday. That's how much I trust your judgment! Didn't even need the review (though it's a great one). Sadly, I never finished Eleanor and Park. There were a couple of lines that bothered me enough to make me put it down, but after reading an interview with Rainbow, I feel I can move past that and I'm planning to return to it. It's such a lovely looking book and I can tell I'm going to fall for Park. Fangirl looks very lovely next to it, too, so I'm glad your love for it made me cave and buy it! *highfive* That's awesome, Karen. I really, really hope it works for you. Her book designs are really hard to resist. I absolutely love the covers for both E&P and FG. I did read a sample of E&P, if I remember correctly. I was interested but not sold. Now I really am tempted because FG was a home run for me. Lovely review, Angie! I was already looking forward to reading this because I really liked Attachments (sorry that one didn't work for you) but now I'm even more excited after seeing how much you loved it. I can't decide if I should read Fangirl or Eleanor and Park first. I know Holly loved the latter. Thanks, Chachic! It's ok. Like I said, it may have been all the hormones. Lol. But this book . . . this is the one. Thank you for this awesome review. I think Rainbow Rowell is my greatest author find this year. I haven't read Attachments yet so Eleanor and Park was the first book of hers that I read. And I was so blown away with that one. And then again with Fangirl. On her website, Rainbow Rowell shares news about her next book due out next year... entitled LANDLINE. And I. can't. wait. She really is a find, with such a unique voice. I have LANDLINE on my list now. So excited!! Yes, re everything you said! I also loved Levi, and yes, yes, I too felt "at home" in Cather's room! In general I feel "at home" in Rowell's books. I love her! What a lovely thing. I'm very much looking forward to trying E&P and to her next book as well. Basically, the people ahead of me on the library waiting list for this book need to READ FASTER. Time to crack the whip, Karen! I feel a great sense of accomplishment that I managed to entice you to read this. It's usually the other way 'round. *fistpump*. As well you should. It was bibliovangelizing of the highest order. I might have been one of the few, but I had to actually skip the fan fiction part of this. I found that part to be boring. I can totally see that, Allie. I expected to feel the same way, and kind of did at first. Then I sort of fell in love with them and them as an extension of her . . . lol. Eleanor and Park was extraordinary. I loved it. Sigh. See, I really need to read it. That's all I wanted to do when I finished FANGIRL. I'll follow my instinct. I read E&P, A, and then FG and that is probably the order in which I liked them-I was just so swept away by the descriptions in the love story of E&P while the fanfiction excursions of Fangirl were more irksome to me. Ugh. I clearly need to get to E&P sooner rather than later.